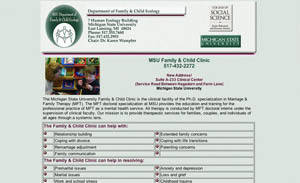 The MSU Family & Child Clinic is the training clinic of the Marriage & Family Therapy PhD Program at Michigan State Univeristy. The Clinic provides a structure for outreach, family-based service to the community, and family therapy research. The Clinic offers specialized programs and research in child welfare, community outreach/social justice, and multi-stressed families.